1.Suitable for small personal items you'd like to protect from the elements: cell phone, wallet, sunglasses, camera, toiletries, small towel, water bottles etc. 2.Shoulder strap can be used over the shoulder or crossed over the chest - allowing for easy, light, and convenient carrying while outdoors. 3.Hardened D-Rings allow you to connect the bag to the side of a raft, boat, or backpack. 4.Roll top and buckle closure allow for air-tight protection against water/liquids. 5.Thick 500D PVC material provides protection from abrasion for screens, glass, and other expensive gear. 1. Heavy-duty vinyl polyester trilaminate construction with durable materials for enough usage. 2. Suitable for quick submersion. 4. High frequency welded seams. 5. Durable, wipe clean and easy to store away. 6. Floats safely if dropped into the water. 7. Adjustable shoulder strap included, it can be carried on the shoulder or by hand. All products sold in Ruiry will be offered a 30 days' free refund and one-year limited warranty. If you have any questions or issues about our products, please feel free to contact us. Lightweight Compact and Durable: Made of ripstop tarpaulin with sturdy welded seam which is designed for years of usage, tear, rip and puncture proof. Perfect for almost any extreme adventure that you can imagine. Easy Operation and Cleaning: Just put your gear in bag, grab top woven tape and roll down tightly 3 to 5 times and then plug buckle to complete seal, the whole process is very quick. Dry sack is easy to wipe clean due to its smooth surface. Perfect Midsize: 10Liter to meet your demands on different occasions. Each bag includes an adjustable and removable shoulder strap for cross-body or shoulder carrying. Versatility: The dry sack can float on water after being rolled and buckled, so you can track your gear easily. Perfect for boating, kayaking, paddling, sailing, canoeing, surfing or having fun on the beach. A nice Holiday Gift for families and friends. If you have any questions about this product by Ruiry, contact us by completing and submitting the form below. If you are looking for a specif part number, please include it with your message. 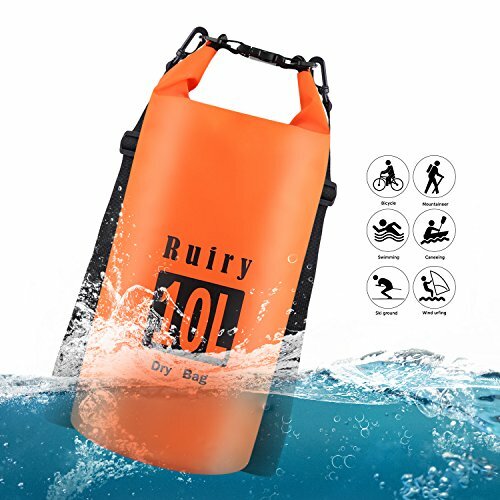 BUBOS Waterproof Dry Bag, Roll Top Sack Keeps Gear Dry for Kayaking, Boating, Canoeing, Snowboarding, Fishing, Rafting, Swimming, Camping with waterproof Phone Case, Yellow. Aquapac Waterproof, Submersible Polyurethane Key Case for Car Keys, Car Immobilizers & Asthma Inhalers, Depth to 150ft / 50m.